Someone sent me this idea recently and I thought it was so clever! 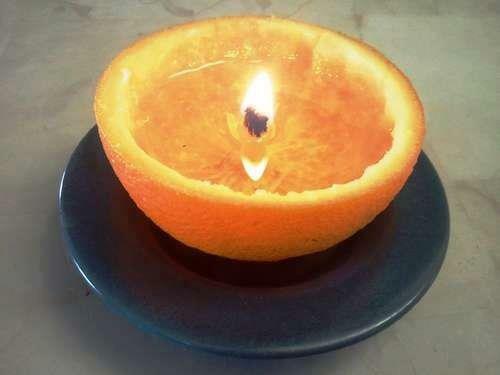 Just take an orange/lemon/grapefruit, cut in half, eat the middle portion, leave the center core-like stem intact. Let this dry out (overnight is good). Then pour a kitchen oil (veg oil, olive oil, etc.) into orange just below the top of the stem. Light stem. It will burn for hours and smell amazing. I did try it as well and it would not stay lit. So I tried the other half of the orange next day which had dried out and it worked like a charm. So I adjusted the blog with that info.